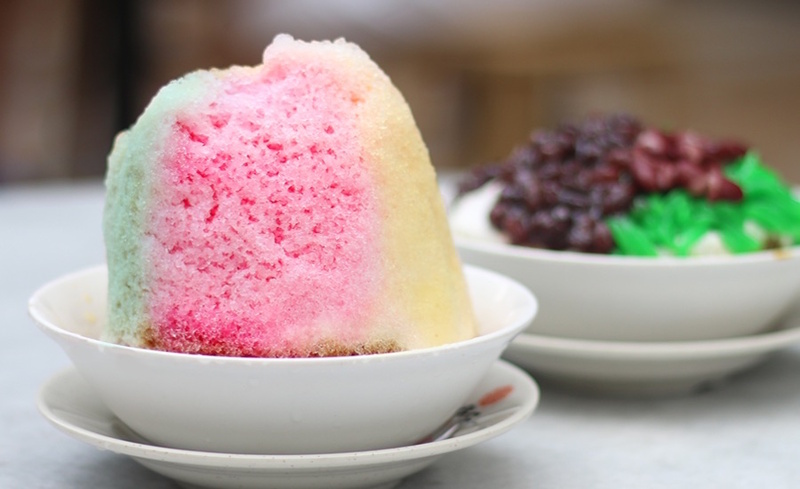 Ice kacang, chendol and more... Singapore desserts are just too good to resist! Got a sweet tooth? Singapore has some pretty good local desserts if you didn’t already know, and that’s on top of our giant list of local dishes. Besides the great selection of local kueh we have, there’s a lot more to the local dessert menu. From hot to cold, soupy to dry and fried… save some space for the desserts! Calling all dessert fiends! Featuring the holy trinity – coconut cream, palm sugar and pandan leaves – Cendol’s main component of shaved ice is perfect for cooling off on a sweltering sunny day, which is all the time. We especially love slurping up those green jelly noodles (made of rice flour) and accompanying mushy red beans. Warning: cendol is usually cloyingly rich, so we suggest having it on its own or sharing with a friend. Psst, we hear Traditional Cendol Melaka at Changi is to kill for! Traditional Cendol Melaka, Block 1 Changi Village Road, #01-2046, Singapore 500001. If you’ve got the late night munchies for something a little sweeter, nothing hits the spot quite like a comforting bowl of tau huay (you can have it hot or cold!). We’re pretty old-school when it comes to tau huay, so we opt for the classics like Selegie Soya Bean. Make sure you buy a couple of fried dough fritters (called you tiao) to dip into your beancurd! Selegie Soya Bean, 247 Jalan Kayu, Singapore 799471. Craving for a snack? 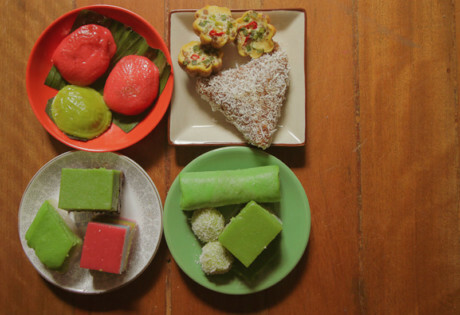 Munch on some local kueh! Ice kacang is essentially the Asian equivalent of a snowcone, or perhaps, even a slurpee in a bowl. The king of desserts here is really a giant mound of ice, dripping in sweet, coloured syrup hides within it bounties of suchas red beans, sweet corn, grass jelly and, of course, the much sought after atap chee (the immature fruit of the nipa palm). 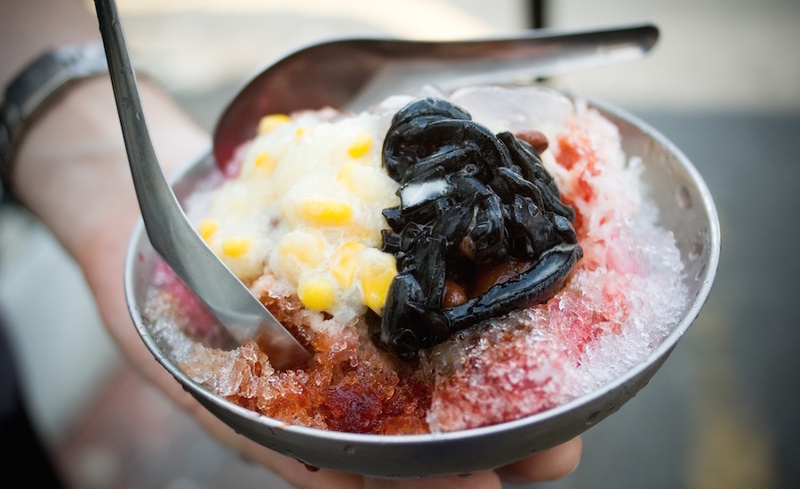 More than just a dessert, ice kacang is also a communal experience given how hot our climate is. When we need to cool off, we head over to Lau Pa Sat’s dessert stall for a literal post-lunch chillout sesh. Ice cream sandwiches and cold desserts are great all year round in Singapore! 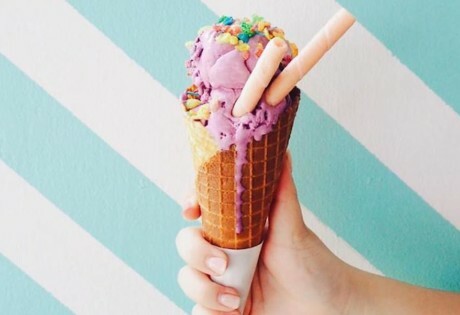 As far as desserts go, ice cream isn’t really a Singaporean one. But if you grew up here, you probably still have a Pavlovian response to the sound of the ice cream bell. Eschewing the ice cream van for a more proletarian solution, these peddlers of ice cream ride around on motorbikes with sidecar freezers. 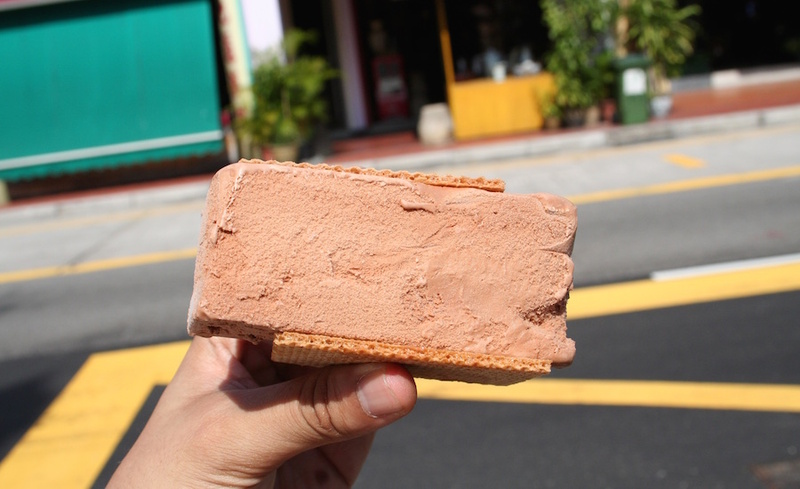 If you want the authentic Singaporean experience, ask for your ice cream bar to be served between a folded slice of bread or thin wafer slices. You can find these ice cream men along the entirety of Orchard road in the afternoons; just look out for the iconic Wall’s umbrellas. 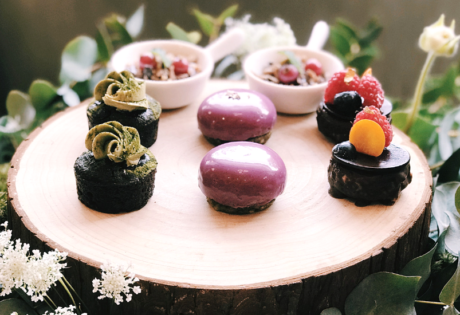 There’s no shortage of colourful and unique kuehs (Southeast Asian ‘cakes’) to be found in Singapore, but one of our favourites has to be tutu kueh. This small, doughy steamed rice flour sweet is often sold at night markets and streetside stalls in Chinatown, usually in bags of three, served on pandan leaves. It’s filled with either ground peanut or brown palm sugar mixed with shredded coconut. If you’re nowhere near a night market, hit Tan’s Tutu Coconut Cake for a taste of this very Singaporean sweet treat. Tan’s Tutu Coconut Cake, 22B Havelock Road, Singapore 162022. 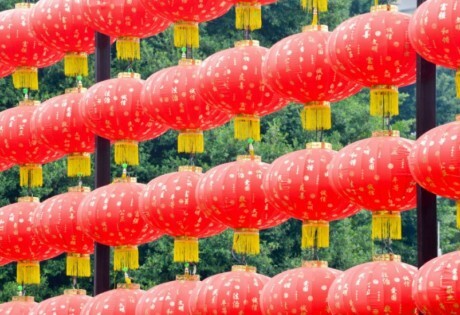 One of the first things we spring for when the weather is unbearably hot (when isn’t it, really?) is this icy dessert. Grass jelly, or chin chow as it’s known locally, is a dark brown gelatinous dessert made from boiling the aged stalks and leaves of the Mesona Chinensis plant (a member of the mint family) for several hours with a little starch. The jelly is then cut into cubes and served on ice. To the uninitiated, the idea of a black herbal-tasting jelly may not be terribly appetising, but served with honey or syrup, it proves to be an incredibly tasty, cooling (in the Asian and conventional sense) treat. Next time you’re near Beach Road, pop by the famed Zhao Ann Granny stall and pick up a bowl of grass jelly for just a dollar. Zhao An Granny Grass Jelly, #01-58, Golden Mile Food Centre, 505 Beach Road, Singapore 199583. Hot and cold dessert stores are ubiquitous in food courts, serving up a variety of decadent desserts like pulut hitam, tau suan and yam paste. But when the mercury’s rising and beads of sweat are forming on your brow, skip the hot stuff for a nice cold bowl of Cheng Tng. 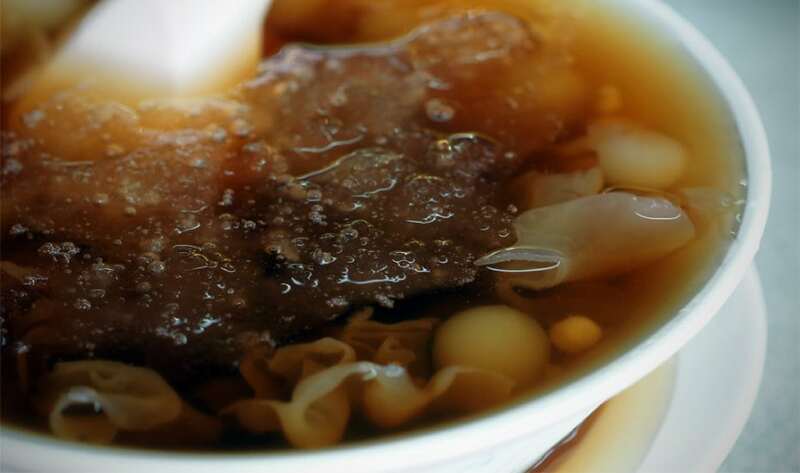 This light amber-coloured dessert is a thin soup served with ice, barley, agar strips, lotus seeds and sweet syrup. You’ll have no difficulty finding this cooling dessert, but for the absolute best, try Ye Lai Xiang Hot & Cold Cheng Tng in Bedok. This stall’s been in business for over 70s years, and the snaking queues stand testimony to its consistent (and cooling) quality. Ye Lai Xiang Hot & Cold Cheng Tng, 1 Bedok Road, Bedok Food Centre, Stall 31. 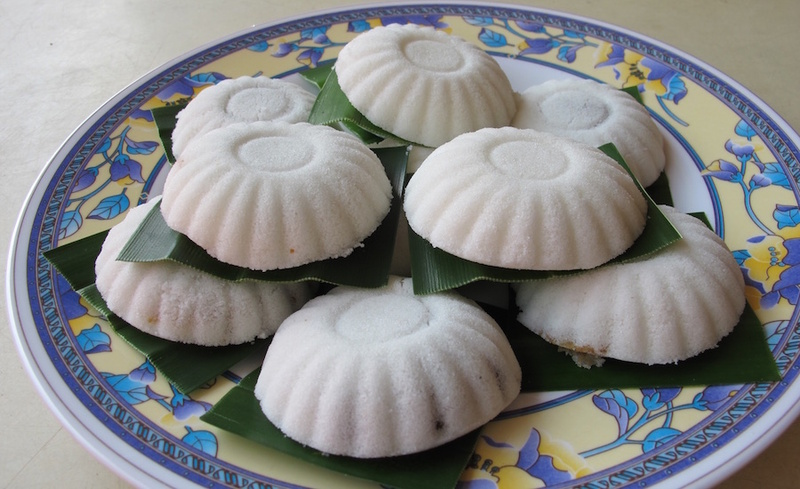 Typically round and green in colour, ondeh ondeh are boiled rice cakes coated with grated coconut and filled with liquid gula melaka. Just a fair warning: once you have your first bite, you might not be able to stop! These super sweet fun sized balls are highly addictive and truly yummy. While dishes like cendol and tauhuay may go back into antiquity, durian puffs are a relatively new local favourite. 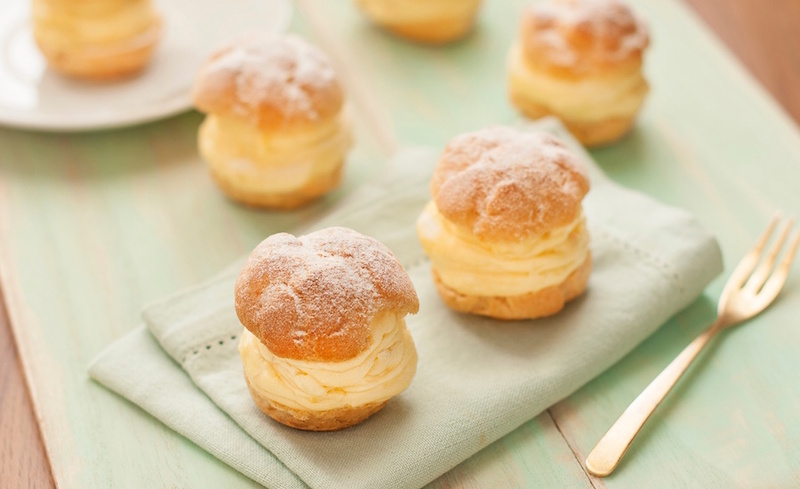 This European-style cream puff has been adapted by swapping the usual plain custard cream for one infused with fresh durian for a sweet, pungent treat. Definitely the most divisive dish on this list, you’ll either hate it or love it. Want a taste of it? Goodwood Park Singapore’s your best bet for its signature creamy durian puffs. Goodwood Park Hotel, 22 Scotts Road, Singapore 228221. p. 6737 7411. Dubbed “frogspawn” for its globule appearance, don’t shoot tapioca pudding down yet because of how it looks! Like most Singaporean desserts, this one also gets a generous lashing of gula melaka, a robustly flavoured palm sugar syrup and coconut milk. You might have a bit of trouble finding this dessert at food courts, but if you’re keen to try Peranakan cuisine as well, The Blue Ginger serves up this refreshing dessert. Tea-time here is as elaborate an affair as it is in England, especially when we’ve got darn good teatime desserts like the pandan cake. Light, fluffy and with a heady dose of pandan sweetness, it pairs perfectly with a steaming mug of Milo. Best part? You can get really great ones from pretty much any Bengawan Solo outlet. Think of Apam Balik as a thick pancake with peanut fillings. 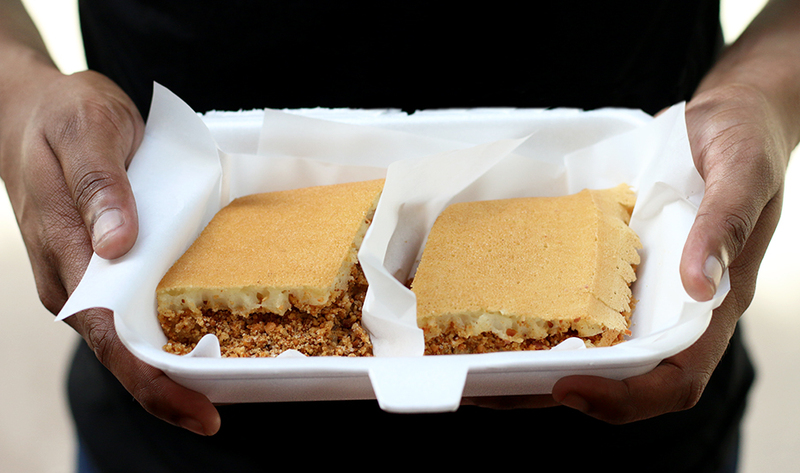 Apam balik is essentially a chew Singapore-style pancake that’s folded over and filled with a variety of sweet fillings. The little Uncle Pancake stall at Old Woodlands Town Centre offers a variety of flavours to choose from such as coconut, cheese or chocolate. And the best part? It’s only a dollar a slice! Uncle Pancake, Blk 1A #01-30 Woodlands Centre Road.